In the beginning everything was flat. The first is from Mark Shuttleworth (Canonical, Ubuntu), titled Beyond Agile: Enabling the Next Wave of Software Development Methods, and talks about a number of very interesting topics such as Lean Software Development. You can find the slides here. but you can't come in. I also liked Code Reviews for Fun and Profit, from Alex Martelli (Google) which you can find here . Which also does look interesting, right? So, I came up with this post. Rule 1: Keep your main branch (trunk) pristine. Your main branch is your project! Don't use it as a garage (full of garbage) to park all the fixes and new features. Use branches instead! Rule 2: Isolate changes in branches. It is a consequence of Rule #1. Place each bugfix and new feature inside its own branch. It will help keeping the main line clean, and it gives you all the power of real parallel development. It's also great for task switching and keeping track of intermediate changes. 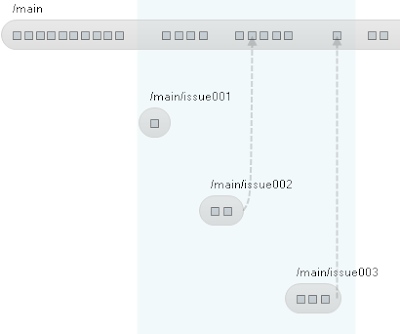 Tip: Associate your branch with a task in your issue tracking system (Bugzilla, Mantis, Jira ...) and close the full cycle. Rule 3: Commit often, more often than you do now! If you develop on the main branch you won't commit every 5 minutes, changes often take longer! If you have your own branch for the task, you're free to commit as many times as you want to... and then you get private change history. Rule 4: Review changes before they go to the mainline. 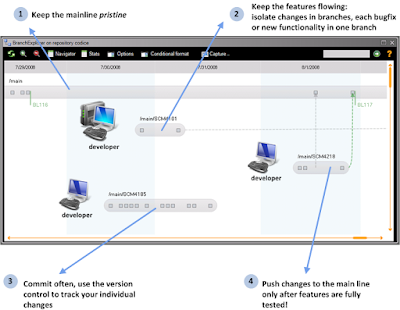 In main branch development (and continuous integration) you run the test suite after the changes are merged. Don't! This is too late, code is already broken! Take the best out of your SCM tool, review your changes before integrating! The bad news is some of the most extended tools out there can’t. A new era is coming... get ready! The technical paper on which Mark's talk was based is available here: http://people.ubuntu.com/~ianc/papers/community-agile/. I would also like to know your opinion on this, this sounds great but ideally the testers should be able to alpha test before you integrate to the mainline, where can they test it? you can't have an environment for each branch surely that'd be too much? !